We recently profiled our good friend and new client Sean Crowley in a feature article for Riddle magazine. Here, the Brooklyn-based vintage menswear dealer explains in his own words how he came to be at the forefront of the classic menswear revival, and why he chose us to make his first made-to-measure suit. Describe your sartorial aesthetic. What influenced or inspired it? How has it changed over the years? I am a shameless Anglophile (surprise surprise) and my style from the beginning has been underpinned by traditional British aesthetics. I grew up on a steady diet of BBC costume dramas and period films, and even though I didn't fully understand what I was seeing at the time, I still knew from an early age that these clothes — whether it was 1750 or 1930 — felt right and had a weightiness and ceremony about them, and I knew I wanted somehow to be part of that world. Watching Jeeves and Wooster as a budding menswear nerd in middle school I had that aha moment when I knew that THIS was how I wanted to dress. Thankfully it's much easier to pull off a 1930s look in the modern world than a 1750s one! Crowley in high school, practicing his sartorial rudiments. In the heady days of middle school I was absolutely hell bent on an uncompromising conviction that sartorial elegance was English — i.e. not American. It was really only a decade later when I began my time at Ralph Lauren that I learned to love the Ivy/trad look, which is utterly American. My taste and style has evolved for sure, but I'd say it's been an evolution of discovery and adoption rather than "Oh god I can't believe I used to dress like that!" What is it you find so compelling about clothing from the past? Oh god — that's a big one. I grew up in a house and in a family that treasured old things. Partly this was nostalgia and collecting for its own sake, but it also included an aspect of continuity. I guess an example would be that we used things like an antique boot jack, old kitchen crockery or antique furniture out of utility; if it ain't broke, don't fix it. There's an element of "ain't broke" with old clothing, but as with any good old object, there's a wonderful weight that time and loving use impart on things. 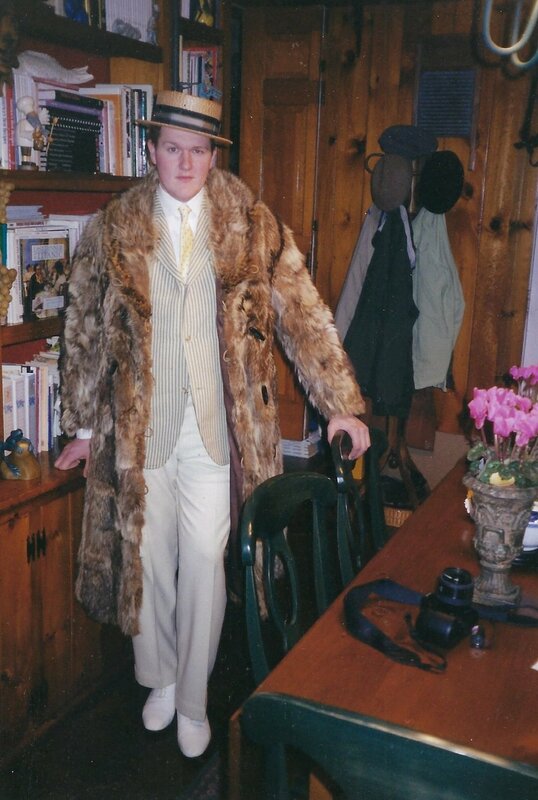 Some people might say "You know the person that first owned that coat is dead now, right?" but that doesn't even factor in for me. For me it's about this thing that was so well made and so loved that it's lasted 80 or 100 years (or more!) and while in my possession I try to be a good steward and take care of it so it might have a life after me. How would you respond to those who dismiss vintage clothing as costumey, or otherwise not to be taken seriously? Certainly vintage clothing can be costumey. It's all a question of how it's worn. I guess I think of the steam punk aesthetic as example of cosplay silliness. My style is everyday for me rather than "fancy dress". Now having said that, I know people who dress very theatrically every day and look amazing and I love it for them. I say as long as it's done well it doesn't matter. Just please no goggles on top hats! Crowley reenacting College in college. The raccoon coat now resides with his parents. What was the reason you initially came to Alan Flusser Custom? What do you think our name stands for? For me, like many menswear nerds out there, Alan’s books were required reading, particularly in the pre-internet world where every shred of information was hard-won stuff. I had discovered Apparel Arts pretty early on, which was my big style/color inspiration, but Alan's books were like looking under the hood. He’s the gold standard of permanent style. He understands cut and proportion like no one else. There are a lot of capable designers/stylists/tailors out there, but I think very few people have that gift of understanding the harmony that should exist between a suit and its wearer. In working at Ralph Lauren I had the good fortune to meet Alan many times over the years. Then jump forward a few years to when you started working with Alan, and I was able to reconnect with him through that. This renewed friendship reminded me of a quest I'd been toying with throughout my life as a tailored clothing junkie. Simply put, I dreamed of a bespoke suit, but was always staggered by the price. I'd seen friends’ failed attempts with cheap tailors and realized and realized that they weren't an option. I knew I wanted a classic Savile Row cut, but $8,000+ just wasn't in the budget. Then again I've also had friends pony up for Savile Row and walk away unhappy. This left me back where I started, with a very nice wardrobe of vintage tailored clothing, but still not a suit made FOR ME. Enter Alan Flusser. It was an aha moment when all these pieces came together and I realized that Alan had exactly the look I wanted and his MTM was completely affordable. Describe your day-to-day attire for work and leisure. My entire wardrobe is basically vintage clothing and Ralph Lauren. I don't wear a suit every day by any stretch. I essentially shift through the spectrum of Ralph Lauren from RRL ruggedness to Polo prep to PL elegance. That's something I always admired about Ralph. He dressed for different stories — different characters in his own little movie. It's not a costume per se, but I always loved that Ralph needed a story whether he was creating a single ensemble or an entire collection. Clothes and dressing have defined your entire life. What do you enjoy most about them? Oh that’s a big one! I’d say I really love the idea of having a big wardrobe and having a lot of options. I love the way clothes make me feel — the sense of occasion no matter how big or small. The pleasure of a well-chosen outfit is a great way to start your day. I love getting up each day and deciding who I want to be. It’s all very esoteric and ultimately I’m dressing for my own pleasure, but it’s fun to build a little story out of every outfit. Even if it’s just very basic combination, in the back of my head I’m always considering each piece and how it becomes part of the whole look that day, whether it’s 1930s gent, 60s Ivy League, British officer, etc. And when in sartorial crisis I always think WWJD? What Would Jeeves Do? Do you have any advice you'd give to other dressers? As always it’s good to know the rules, but important not to get bogged down by them. I think a lot of young guys get too hung up on “right” and “wrong” rather than letting their gut guide them. I also recommend avoiding blogs and forums. In general they’re a wretched hive of armchair haberdashers and misinformation. For one reason or another I’ve never followed any of them and think I’m the better for it. My “blog” was Apparel Arts and talking in real life with people who knew their onions. But I digress. As for other men looking to improve/increase their wardrobe I say look for quality. There’s a lot of cheap crap out there. Whether it’s new or vintage, go for quality over quantity. I see a lot of young guys gorging on junk. Sometimes less is more. 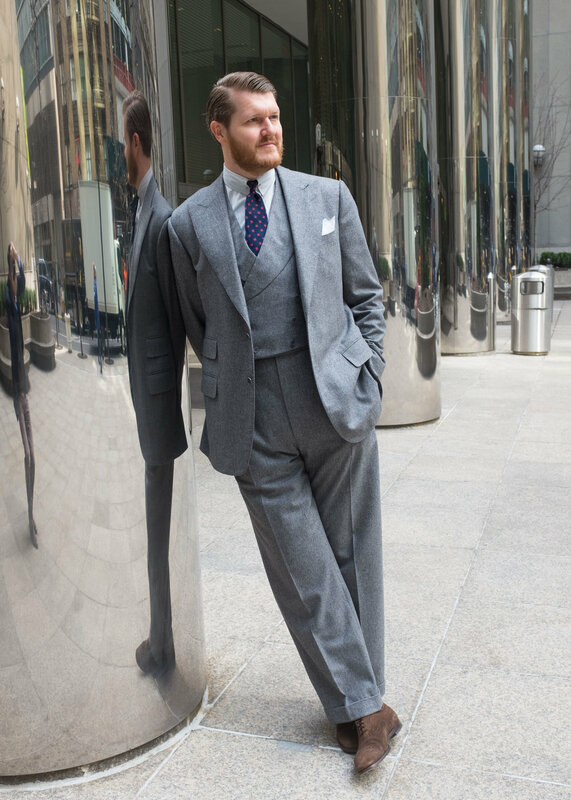 Crowley’s made-to-measure suit and bespoke waistcoat from Alan Flusser Custom.